Stitch Some Sweet Treats for Christmas! Stitch a batch of yummy baked treats for Christmas with these gingerbread cookie embroidery patterns! 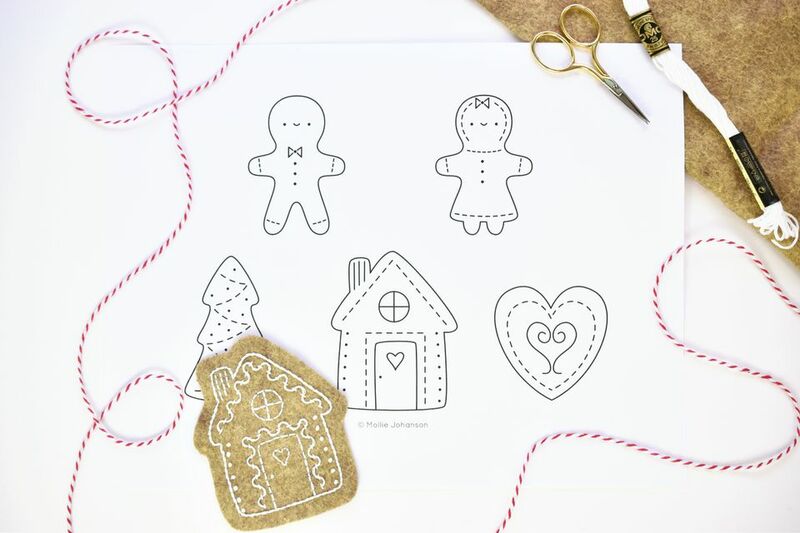 This collection of five gingerbread designs is both cute and quick to stitch. Plus, kids and grown-ups alike will enjoy them! There are more than a few ways to put these sweet gingerbread cookie patterns to use. They work well as individual motifs stitched in color. Add them to a child's t-shirt or some cute kitchen accessories. If you enlarge them, they would be adorable as embroidered mini stuffed toys. Simply cut around them, leaving plenty of room for a seam allowance, then sew each one to a matching back piece. They also make excellent Christmas ornaments. Stitch them with white embroidery thread on gingerbread-colored felt, then cut around the design. Glue the piece to a matching piece of felt and add a thread hanger for a quick decoration! The sweet gingerbread cookies pattern is a downloadable JPG file. You can adjust the size using an image editing software if you'd like. Or, print the file at full size with your printer set to "landscape" mode. This will give you patterns that are about three inches tall on average. Any evenweave embroidery fabric works for this pattern, but it helps if it has a tight weave to accommodate small curves. Felt is also an excellent choice for these gingerbread cookies. Using fabric that has a gingerbread coloring to it gives you an instant cookie background, with the stitching acting as the icing! Use your favorite transfer method or the one that works best for the fabric you are using. If you make the felt version in the example, use the tracing paper method. However, when working the woven running stitch wavy lines, it's best to remove the paper after you work the running stitch, but before adding the weaving. For color suggestions, look to the colors above. Of course, they are simply ideas to get you started. Select shades that appeal to you. Or, work the entire patterns in white or as redwork embroidery. When working the sweet gingerbread cookie patterns, use three strands of standard embroidery floss or size 8 perle cotton throughout. As with any pattern, it's okay to choose your favorite stitches, making the design as simple or complex as you like. These stitch suggestions show how the gingerbread house example was stitched, as well as how those stitches apply to the other designs. Work all of the cookie outlines with stem stitch. Use back stitch for all of the solid line extras throughout the patterns. Form all of the dots with french knots. Use fly stitch, worked as a gentle scallop, for the mouths of the gingerbread people. Use woven running stitch for all of the dashed lines. Start by stitching running stitch, then go back and add a wavy line under the stitches to create an icing look.